Nepal is among the least developed countries in the world with nearly 40% of the total population living beneath the poverty line. This situation is made more complex by significant gender, caste, ethnic and geographic disparities. However, by improving literacy, we can help families develop a better life. And this is what we have begun. In a world dwarfed by Chomolungma, Goddess Mother of the Snows, it is the warmth of good people that lights up hearts. 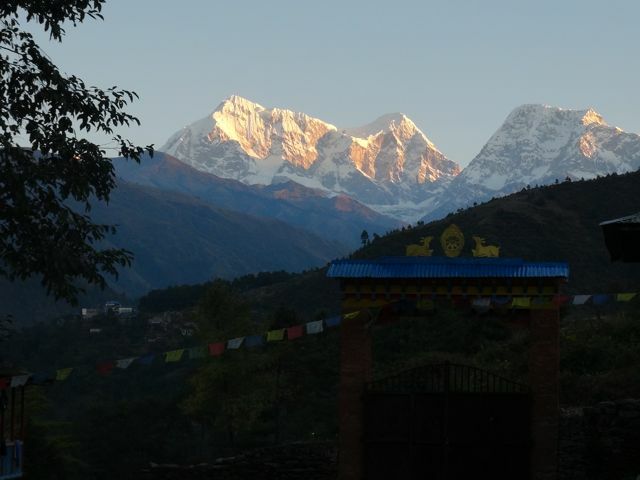 In Solu, in the shadow of Mount Everest, lies the small subsistence farming village of Lura. Water has to be carried from the creek and firewood collected in the forest, work done by women and children while their men are away working or risking their lives as guides on mountaineering expeditions. Children can now get an education, either at a government school nearby or at a private school one hour’s walk away, across the valley. And although it is very basic, it is more than their mothers can get. Or could, until ‘Beyond the Smile’ arrived with our literacy program. Also just arrived in Lura is electricity. Instead of huddling around smoky fires at night, now families can live more socially and productively with light for cooking, for children’s studies, and now for women’s classes. An enormous number of women in rural Nepal cannot read or write, which means they can neither teach their children nor play a useful role in local affairs, meaning that villages are denied 50% of the talent and wisdom they should be using to improve conditions. Without literacy, women have no access to written information, hence no power to make decisions, and can’t even read letters from their absent family. But Lura is just the beginning, and your contribution will help this visionary program grow, across the Himalaya. – improve health, education and sustainable livelihood activities- strengthen local development capacities and engagement.This is not just an idea: we started in 2009, working with the Young Star Club (YSC), and initial and advanced literacy programs devised by Dialogos, a Danish NGO were successfully implemented. Then it was time to practice the newly acquired skills, with the very special ‘Discussion with Family Members Program’, this one designed by the amazing Sangeeta Shrestha of Slisha, a remarkable NGO based in Kathmandu. Once again, you helped fund this through gofundraise and the Australian Himalayan Foundation. Next, we looked at the Community Forest Villages. Lura, Roshi, Boldo and Arubot are the four villages who manage the Gyamdanda Community Forest. They have a five year plan for forest management and devising a business plan with the villages, for the villages, based on existing human and natural resources, based on job creation and enhancement of resources, is the next goal. Water pipes sponsored by the last group to visit Lura ( October 2014) brought water to the property of the Forest management Group in Lura. Some of the facilities were damaged in the April 2015 earthquake, but we are ready to tackle the next step, creation and construction of a greenhouse built from local renewable resources as much as possible. This will be used to grow tree seedlings to regenerate the forest. We want everyone around the world to know how successful this program is being, and how lives are improving. Since 2007, I have visited the area every year to work, and to stay with Lakpa Tamang and his family. The villages, their present and future generations are getting the best chance for the social, ecological and economical challenges they’ll face. Not just in Nepal! The documentary will tell the story of the project through my experience as a filmmaker and friend, as I interact with the families involved. Seen through the personal development of this Lura family, and filmed over several years, the project’s effectiveness for the people involved should help inspire many more people to action, to want to get involved and make a real difference. In a world dwarfed by Chomolungma, Goddess Mother of the Snows, it is the warmth of good people that lights up hearts.